Our Sagebrush heavy-duty laminated spotting boards are designed to make the spotters job much easier to show the shooter where the hits or misses are. With the bright white back and vivid colors the shooter can instantly see the board. 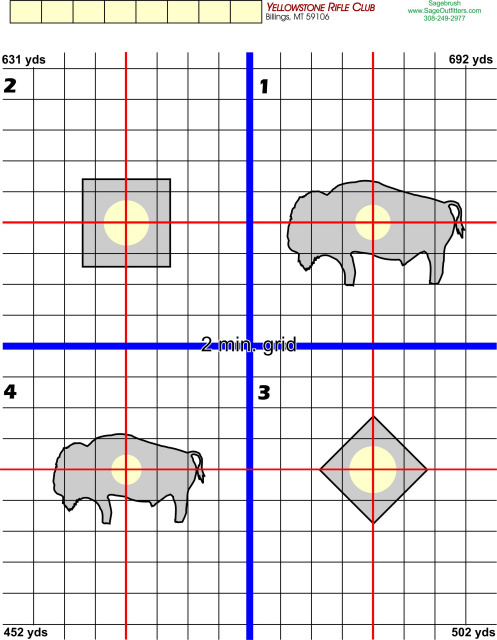 Each target is centered on a minute of angle grid for precision sight correction. For added convenience there is a score card for each target. Quigley Spotting Board by Sagebrush. Silhouette Spotting Board by Sagebrush. Alliance Spotting Board by Sagebrush. NRA Spotting Board 600-1000YD by Sagebrush. NRA Spotting Boards 200-500YD by Sagebrush. Casper Spotting Board by Sagebrush. Yellowstone Spotting Board by Sagebrush.